Is it just me, or do all the things in your house seem to break at the same time. We've been spending way too much time at Home Depot recently, but, luckily, it gave me a chance to pick up a few paint chips for a quick little Valentine craft. Choose a paint chip in whatever color you like. Since we're so close to Valentine's Day, I chose pretty shades of pink. Take a heart cookie cutter or stencil and trace out your hearts. Cut out your heart. Punch a hole in the corner. I prefer to use a hole punch that makes a smaller circle, because it's a little more discrete. Then, cut a piece of ribbon and pull it through. This project is really easy, inexpensive and I think the results are super cute. Mel, the Crafty Scientist has an amazing Pinterest board full of very creative Paint Chip Crafts. Are you getting crafty this Valentine's day or making it simple and using store bought cards? Welcome to this week's Kid's Co-op! This week, there were 3 new activities that caught my eye: Snowstorm in a Bag by JDaniel4's Mom, Controlled Fizz by Life with Moore Babies and Crystalized Snowflakes by Gift of Curiosity. These are fun ways to introduce simple science concepts to your child and have fun too. Do you have any other ideas for simple science projects or easy activities for kids? If so, link them up or leave a comment below! This is such a fun time of year! Check out all of the new crafts, recipes and kids' activities with this week's edition of the Kid's Co-op. When it comes to kid crafts, there are a few things that really appeal to me. Obviously, they have to be fun for kids, but my favorite crafts are easy, made with recycled materials, and inexpensive. It's always a win/win if I have all of the materials at my house, and don't need to buy anything special. All 5 of these crafts are fun, colorful and perfect last minute crafts for Thanksgiving! 1) A Gratitude Tree is an easy way to teach your children what Thanksgiving is all about. 2) Want to dress up your Thanksgiving dinner table with some Colorful Turkey Place-markers? This easy Turkey Craft is bright and cheery and I'm always a sucker for googly eyes! 3) This Thanksgiving Collage Corn craft is great because you only need a few things to make it, and they double as napkin holders for your thanksgiving feast! 4) For toddlers who haven't quite mastered their fine motor skills, here is another version of the Easy Indian Corn craft that is super simple and great for little hands. 5) No matter how crafty you are, anyone can make this Turkey craft for preschoolers with a paper roll and paper plate. Do you have any other cool paper roll crafts for Thanksgiving? Comment below with a link! Want to see more? 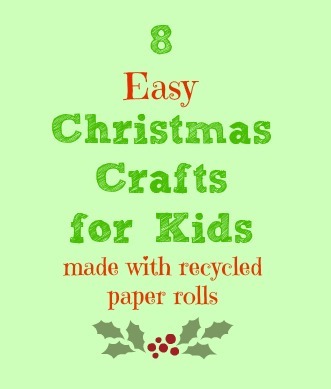 Here are 8 Christmas Crafts made with Paper Rolls. 10 Easy St. Patrick's Day Crafts for Toddlers, Preschoolers & Older Kids too! We're hopping from one holiday to another, and, with each new holiday comes fun kid's crafts. So, I've done a little searching and put together a collection of 10 Easy St. Patrick's Day Kid's Crafts that you can do with the at home or in the classroom! If you know of other good crafts or activities that I didn't list, leave me a comment below or link up with Fun for Kid's Friday and I'll check it out! 1. Learn how to build a Leprechaun trap. 2. Make a Leprechaun Beard with orange felt. 3. This Rainbow Collage Craft is perfect for little hands and you can even add your own pot o' gold! 4. Recycle toilet paper rolls and turn them into shamrocks as shown here. 5. Make a Lucky Charm Necklace with shamrocks and noodles. 6. Create colorful Pot of Gold Collage Art. 7. Make some Coffee Filter Shamrocks as shown here. 8. Sweet and Lovely crafts shows you how to make make Thumbprint Leprechaun Book Marks here. 9. The Seven Year Cottage shows us how to make a sweet and salty St. Patty's Day Party Mix. It's Magically Delicious! 10. Make a Handprint Leprechaun as seen on Meet the Dubiens. Don't forget to leave some evidence that a leprechaun was in your house. I did this last year and my kids thought it was so funny. When you need a quick winter boredom buster, nothing is better than using recycled materials from around the house to whip up a cute holiday craft. There are a few craft staples that I always have on hand, such as pipe cleaners, construction paper, googly eyes and ribbon. And, recently, I've added another item to my craft stash: empty toilet paper tubes and other paper tubes from paper towels, tin foil, etc. I can just imagine the look on my brother in laws face if I were to show up on Christmas Eve and hand this over to him. I might do it just for a good laugh! What do you think? A day in the life of a SuperMom - by The Ohana Mama - We've all been there. You know... the days when you forget show-and-tell, left the diaper bag at home, or your kid got soaked sliding on a wet slide at the playground and the only thing you have in the car is a pair of snowpants (well, maybe that last one is just me...) but these things happen to the best of us! Ohana Mama can relate. Read all about it here. Things to Make - Salty Watercolors & Water Painting - by No Monsters in My Bed, DC- This is an easy activity you can do with your kids at home. All you need is watercolor paint or food coloring, white glue, table salt, a pan or platter, and thick paper or cardboard. Here are all of the details on how to make Salty Watercolor paintings with your kids. Home Made Mac & Cheese - by The Big Binder, MI- I was watching a little bit of the Biggest Loser last night and Macaroni and Cheese was one of contestants' favorite food. As I was watching, I was thinking how the boxed mac and cheese didn't look tasty enough to tempt me. However, this mac & cheese recipe on The Big Binder sounds amazing! There is even a word of warning that "It is dangerous" and "Do not plan on left overs!" If you're on a diet, please forget you ever read this. But, if not... here is the recipe. 4 Easy Ways to Save on Children’s Clothing - by Atlanta with Kid- A lot of moms use clearance and consignment shopping to save on kids clothes. But, this post from Atlanta with Kid shares a couple other ideas that I've never heard of such as OutGrowingIn.com and Thred Up Clothes Swapping website. Check out the details here. Homemade French Bread Recipe by Iowa Moms - Before I had kids, going to the store to buy a loaf of French bread was easy. But, once you have a kids, things change. There have been so many times I didn't make it to the grocery store because my kids were napping, sick, just plain cranky, or all of the above! So, the thought of staying home and making bread might actually be an easier alternative than running to the store. Here is Iowa Mom's easy recipe for making French bread at home.